To KNOW what a religion is about, read their 'sacred' book. If you do not, you can be caught totally unprepared for destructive surprises such as September 11, 2001. One must study and be aware to recognize and stop a possible enemy. Who can forget that as a shocked America wandered amidst the rubble of destruction and thousands of horrific deaths, Mr. Bush stood before the microphones and said this: "But Islam is a religion of peace." Really? To hear him say that under the circumstances was like being hit with a stun gun. Especially when he said it a second time for emphasis. Blindly accepting what is said about Islam without examining their "Sacred Book" is at one's own peril. The walking dead have been made to believe that "the majority of Muslims are good people and that there are moderate Muslims." These murderous actions are only committed by a few radicals, they say. 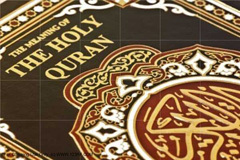 However all Muslims are guided by the same book, The Koran, which they all are required to follow. It is past time to READ this book that instructs everyone who identifies with Islam. Here are some examples from The Koran (Qur'an) that is taught in the mosques and dictates the 'duties' of Muslims. These are only a few of the rules from "The Book of Peace." Quran (2:244) – "Then fight in the cause of Allah, and know that Allah Heareth and knoweth all things." Are there Muslims that can be trusted? Only those who renounce the Koran, and withdraw from the Mosques. Otherwise, even if they identify as "moderate," they are suspect since they all live under the dictates of The Koran and all of these terrorist crimes against humanity are by Muslims who are brainwashed into committing murder in the name of Allah. This is personally painful since I have never met a Muslim I didn't like. Indeed, I once saved the life of a practicing Muslim in Springfield, Massachusetts. The problem is, that these people who can be so very gracious, helpful and sharing, and have contributed so much to the sciences, philosophy, architecture, art and literature, are being totally deceived into becoming what they are not. That is the real tragedy, since they are all on the road to Hell without knowing it. Hopefully they will come to their senses before it is too late. That is my prayer.